Whether you’re heading out of town for a specific occasion or looking to plan a quick weekend getaway to relax and re-charge, there’s something special about time away with your girlfriends. “A trip with your favorite girls can make all the difference in your sanity and continued productivity,” says Ariana Pierce, a travel and lifestyle expert. Pierce, who makes it a priority to take at least two trips a year with her girlfriends says the getaways help them to remain close and feel inspired. In honor of National Girlfriends Day, whether you’re a squad of one, or a group of many, let the day be a reminder to nurture those friendships. With the help of some fabulous women who know a thing or two when it comes to traveling with their crew, we’re sharing some unique destinations that promise to deliver memories you’ll be talking about long after your bags are unpacked. Girl’s getaway with Style & Travel Girl Passport Covers, Nov. 4, 2017. “It’s the perfect place to escape your norm without breaking the bank,” says Pierce. If you and your girls are foodies, check out the Quebec City Food Tour for a chance to try amazing French-Canadian cuisine along with their famous 1608 cheese. Here you’ll get a taste of Europe while still in North America. For the adventurous type, Jenna Guarneri, CEO and founder of JMG PR, highly recommends Montmorency Falls for the breathtaking views, and, if you dare, try the 985-foot double seat zip line for an alternative way to see the falls! If you enjoy bonding with your girls over a glass of wine then this unique winery is not to be missed. Malibu Wine Safari allows you to not only explore the 1000-acre Saddlerock Ranch and vineyards, you can embark on a safari where you’ll get the chance to see some of the most beautiful animals up close and snap some amazing shots for your Instagram stories. “Not only does it give you that luxury feeling, it’s filled with so much adventure,” says Pierce. A major plus for Pierce was getting to meet, and feed Stanley the Giraffe! Located only 30 minutes outside of LA, it’s the perfect day getaway. When a city is voted as the No. 1 place to visit by experts and national lists, it should be on your list of places to visit. Book a stay at the Hotel Le Marais in the city’s famous French Quarter where affordable meets luxury. When in NOLA, you must try the classic jambalaya at Jacques Imo’s Cafe, po’boys from Killer Po-Boys, and then indulge in sugary beignets from Cafe Du Monde. Pierce recommends keeping your phone charged at all times because there are so many amazing moments you’ll want to capture. No matter what age you are, there are still those places that appeal to the kid in all of us; Walt Disney World in Orlando, Florida, is one of them. With Disney’s After Hours you and your girlfriends can have the Magic Kingdom all to yourself. For three hours you’ll have access to more than 25 of their most popular attractions and character greetings, with little-to-no wait, a major plus for those like Pierce who don’t like waiting in line for hours just to get on a ride. “Another added bonus is getting to take pictures in front of Cinderella’s Castle up-close and personal,” she says. To sweeten the deal, your ticket includes free ice cream, popcorn, and bottled water all night long. Note: This special is only available for a season and there are limited tickets available so plan in advance. Looking to stay for a few days? Book a room at the Grand Floridian Resort and Spa for an absolutely magical experience from the moment you step inside. You and the girls can grab breakfast at the Grand Floridian Café or dine at 1900 Park Fare which offers buffet style breakfast and tea with Disney Characters. Who wouldn’t want to dine with Mickey and Minnie? A vibrant city known for its rich, musical history, Nashville offers endless experiences. Music City may be the heart of country, but its genres have expanded, from blues to rock-n-roll, and you can catch live performances throughout the city. Kelly Ford, co-host of the Ty, Kelly & Chuck Show recommends the honky-tonks on Broadway with lots to choose from including new bars from artists like Luke Bryan, Jason Aldean, and Dierks Bentley. If you’re looking for the real Nashville honky-tonk experience, check out Tootsies or Legends located along downtown Broadway. For true, Southern cooking, Hattie B’s for hot chicken is a must and you can’t leave without ordering the banana pudding. The Loveless Café is both on Pierce and Ford’s list of go-to restaurants. An old ’50s motel and restaurant, the iconic neon sign alone is an insta-worthy photo. 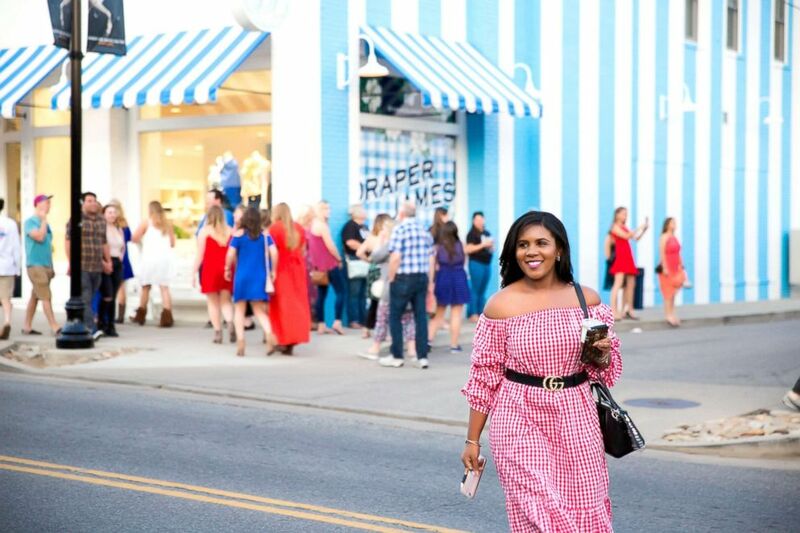 For a bit of shopping, Draper James, Reese Witherspoon’s store in the 12 South shopping district is super cute and preppy and worth a visit. In the alley next-door is one of the most instagrammed spots in Music City, the “I Believe in Nashville” sign. “You and your squad have to snap a shot there,” says Ford. Ariana enjoying some shopping in Nashville, Sept. 9, 2017. If you’re looking for a night out on the town, L.A. Jackson is Ford’s favorite upscale rooftop bar located inside the Thompson Hotel in the Gulch, a hip new area downtown. For cool places to stay, check out Noelle, Nashville, a new boutique hotel, Bobby Hotel, a vibrant lifestyle hotel complete with a rooftop lounge and dipping pool, or 21c Museum Hotel, a multi-venue contemporary art museum.